Sir Ben Ainslie, the most successful Olympic sailor in history, has accepted the prestigious Magnus Olsson Award and revealed that new Volvo Ocean Race-winning skipper, Ian Walker, was a big inspiration at the start of his stellar career (full story below). 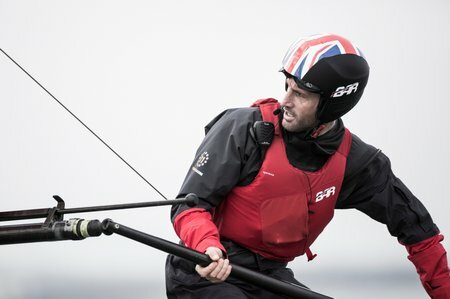 GOTHENBURG, Sweden, June 28 – Sir Ben Ainslie, the most successful Olympic sailor in history, has accepted the prestigious Magnus Olsson Award and revealed that new Volvo Ocean Race-winning skipper, Ian Walker, was a big inspiration at the start of his stellar career. The prize is awarded annually in the memory of Olsson, one of the most recognisable figures in offshore sailing and a six-time competitor in the sport’s leading round-the-world race. Four-time Olympic gold medallist Sir Ben followed Brazilian Torben Grael, the Volvo Ocean Race 2008-09 champion, as recipient of the prize given to the sailor who has made the biggest contribution to the sport in the past year. Sir Ben, who is spearheading a British tilt to win the America’s Cup for the first time for his country, in 2017, paid tribute to the Swede. Sir Ben also revealed that Walker, 45, who was in the same British Olympic teams in 1996 and 2000, had fired his own ambition. Walker, skipper of Abu Dhabi Ocean Racing, won silver medals in both those Games. “It was absolutely fantastic to see Ian Walker leading Abu Dhabi Ocean Racing to winning this race. I’ve known Ian my entire career. As I started out in Olympic sailing, he was really an inspiration for me, being that bit more advanced in the Olympic programme.